The running time of Les Misérables: The All-Star Staged Concert is to be confirmed. For evening performances a theatre bar will be open from 6.00pm and the auditorium will open at 7.00pm. For matinee performances the bar and auditorium will open at 2.00pm. A limited number of the very best seats, previously held for the Producers or VIPs, are now available to book in advance. Please check individual performances for price availability. *Prices include a £2.50 online and telephone booking fee. Booking fees do not apply to tickets purchased in person at the box office. Prices also include a £1.25 theatre restoration levy which contributes to the on-going refurbishment of our eight theatres. For more information click here. All ticket prices are subject to change based on demand. Book early to ensure the best seats at the best prices. Please note: Seating plans are not accurate representations of the auditorium. While we try to ensure they are as close to the actual theatre plan as possible we cannot guarantee they are a true representation. Customers with specific requirements are advised to discuss these with a member of staff prior to booking to avoid any confusion. 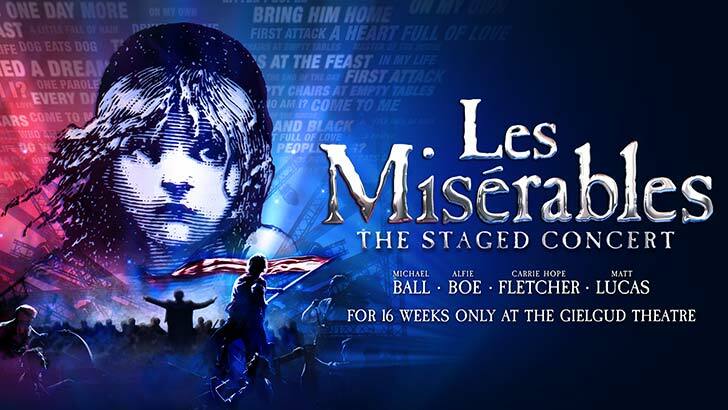 Discounts are offered, subject to availability, for disabled theatregoers and one companion, including wheelchair users and Patrons who have specific access requirements. Access customers must use the buttons below to book specific Access performances (when available). Access bookings and further information can be requested by calling 0344 482 5137 or emailing access@delfontmackintosh.co.uk. Sorry, no Group rates are currently available. Please note: Group bookings will be subject to a £2.50 per ticket booking fee. To add some extra sparkle to your evening, why not upgrade your Les Misérables: The All-Star Staged Concert booking to one of our Champagne or VIP Packages? Prices start from £220.00 per person, inclusive of VAT. If you have already purchased your tickets, you can add this package from £45 per person, inclusive of VAT. Please call 020 7766 2112 to upgrade your booking. Prices start from £274.00 per person, inclusive of VAT. If you have already purchased your tickets, you can add this package from £99 per person, inclusive of VAT. Please call 020 7766 2112 to upgrade your booking.